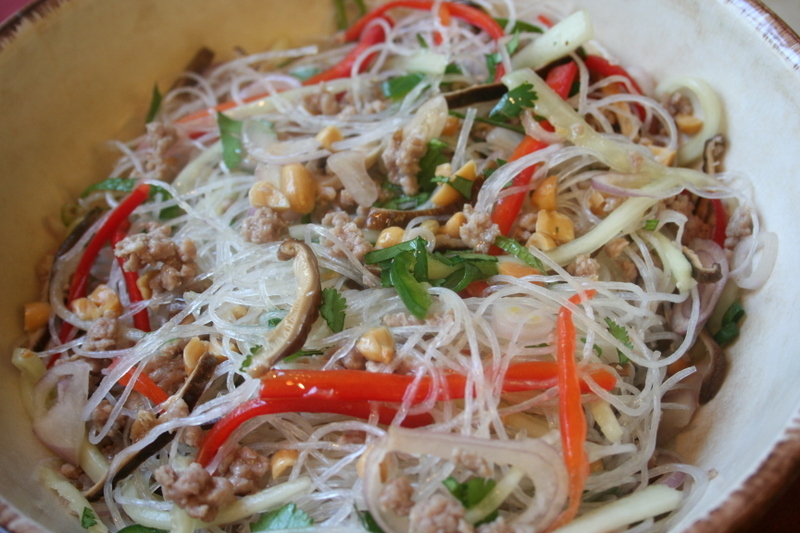 Today was our first really warm day, and this tangy Cellophane Noodle Salad was perfect, crunchy and refreshing. It's been a fish sauce kind of week, and I've enjoyed several recipes calling for it. Although it has fish sauce in it, there's no fishy taste (cross my heart). 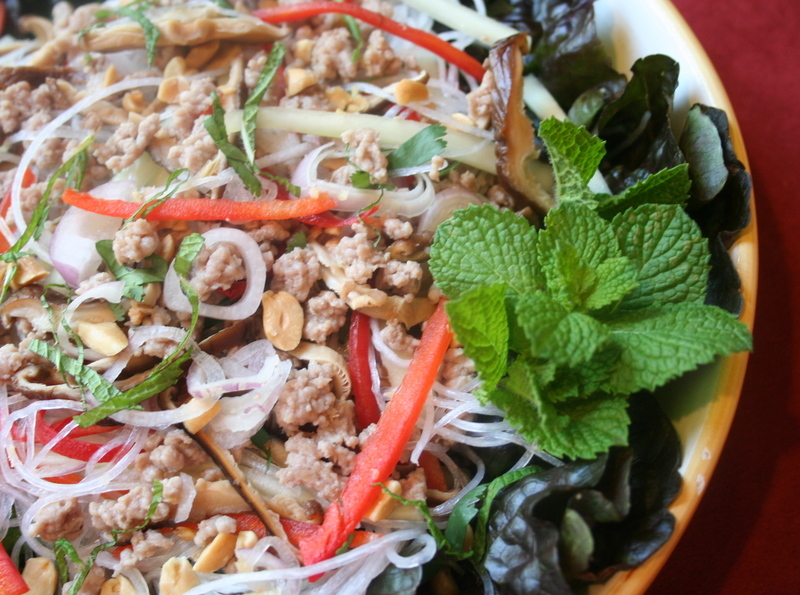 This salad also contains a little ground pork, but it doesn't taste meaty. In fact, you could leave out the pork altogether and add more thinly sliced veggies, and it would taste just as good. 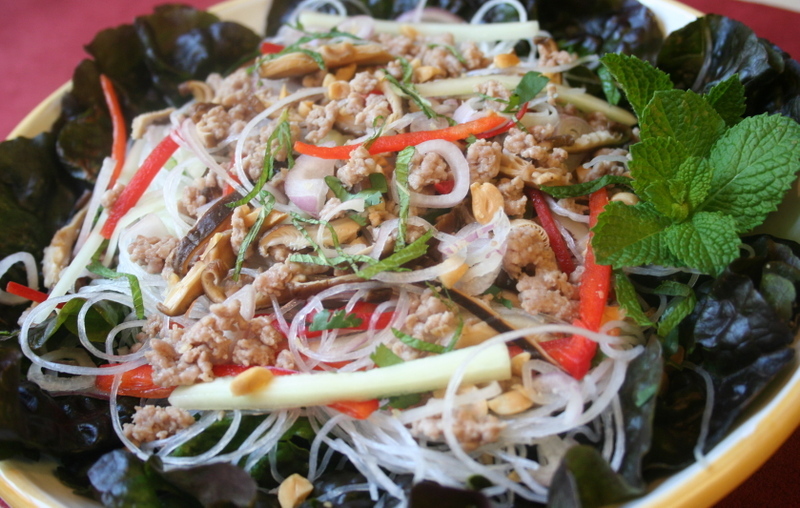 The backbone of the salad is the cellophane noodles, which are also called bean threads. You soak them in warm water for 30 minutes as you prepare the other ingredients for the salad, then toss everything together. If you've never had cellophane noodles you should treat yourself to them. They're so much fun to eat, and have a slightly crunchy texture that I enjoy very much. Kids usually like them too. And they are pasta, so I submit this to Presto Pasta Night, which was created by the lovely Ruth at Once Upon A Feast . She should have the Roundup of the other pasta bloggers today. You should be able to find cellophane noodles at most grocery stores in the Asian section. They look a little glassy to me, and are very stiff. Here's the kind I used. After the noodles soaked for 30 minutes in warm water, I tossed them with the dressing, cooked pork, slivered veggies, lemongrass, mushrooms, shallots, chopped peanuts, mint and cilantro. Then arrange the noodles on a bed of red leaf lettuce and garnish with mint, cilantro, and more chopped peanuts. I enjoyed this salad. Season the pork with the salt and white pepper. In a sauté pan over high heat, sauté the pork until it turns opaque and is cooked through, 3 to 4 minutes. Transfer the pork to a sieve and let drain, then place in a large bowl. Drain the noodles and add to the bowl with the pork. I have been craving noodle dishes with loads of vegetables. This looks divine! That is a standout photo! Even the peanuts are crisp! Great looking salad and I really like it's one that would be really good with or without the meat. Sher, oh I miss this salad!!! My mom had a tradition of making veg dish on the first day morning of Chinese New Year, her dish almost just like yours (pork left out, replaced with more different types of mushroom and more store-bought tofu-puff). Although I generally don't like salad, definitely give this one an exception !!! So beautiful! So easy to do! Gorgeous! I'm just starting to feel my way around Asian noodles and I really like them. Thanks for the wonderful recipe, Sher! Sher, I just pulled out all the recipes I have for cold noodle salads last night and they all felt too "heavy" for me. But this one! Ooh la la, just right! It's soo pretty... I want to reach out and grab a bite! Ooh, a definite tagger. What a beautiful photo -- all those glorious colors. Thanks for sharing. I like your recipe better than the one I did the night before you posted this. I had never made this kind of salad, but had eaten it at Vietnamese restaurants. Yours sounds much more complex in flavors and very good! Nice photos, too. I love those clear noodles- they do look like cellophane. Great recipe! 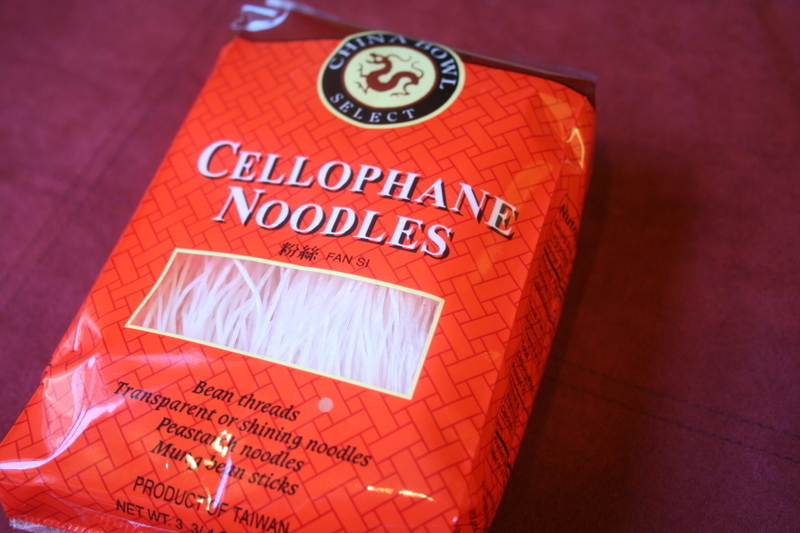 I have never heard of cellophane noodles. I bet this is really good! has it really been so long that I've stopped by that I nearly missed the noodley gem? I'm sorry Sher, will you forgive me? I'd make excuses for my absence but they'd just sound hollow.... Okay, groveling over. This sounds AWESOME! I love cellophane noodles!